Stepping into the villa’s serene realm you’ll notice a beautiful balance of bright, open spaces, refined fittings and luxurious, spacious interiors that allow for full enjoyment of its tropical setting and ocean views. 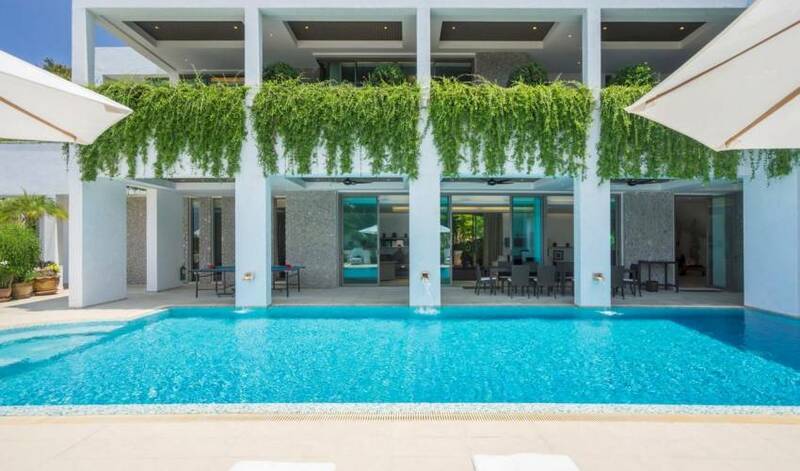 Situated on a hillside estate in one of Phuket’s most prestigious coastal addresses, One Waterfall Bay will delight families or groups seeking a secluded holiday, yet one with all the fun of Asia’s most dynamic resort island close at hand. 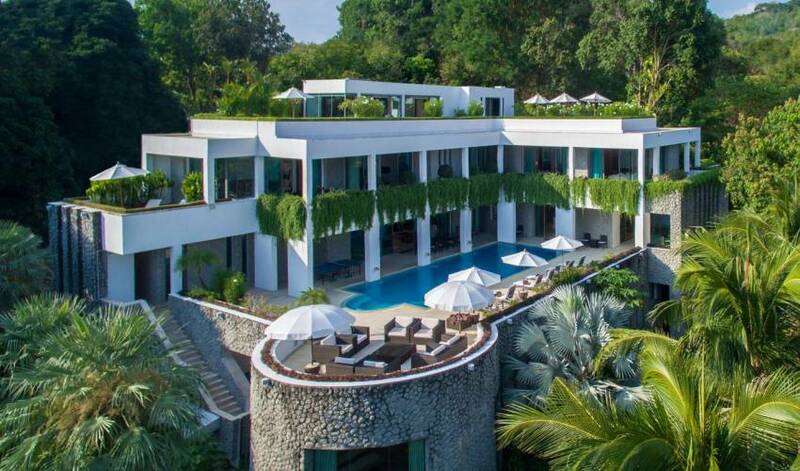 This multi-floored villa is set around a wide pool terrace for sun-drenched frolicking by day and stargazing at night. Ideal for entertaining, the villa boasts a swimming pool with jacuzzi, a futuristic cinema room, professional kitchen, elegant indoor and outdoor dining, a spa room and a choice of cosy gathering places including a living room, study and rooftop terrace. In the corner of the formal dining room is a pool table for an extra touch of fun. The villa’s five main bedrooms, which include two decadent master suites, feature ample furnishings and ensuite bathrooms with bathtubs or jacuzzis. With the exception of a twin-bedded garden-view room, all other bedrooms are furnished with king-sized beds. A sixth bedroom, smaller in size but with king-size bed and a private bathroom, offers additional accommodation for two. Complementing the villa’s impressive facilities is its staff, including the friendly villa manager and Thai chef who is on hand to expertly prepare all your meals throughout the day. 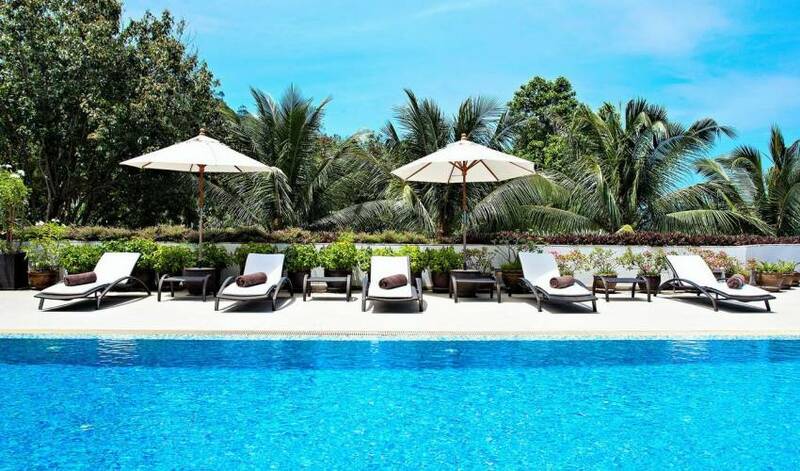 The guest relations manager will help you discover the myriad island sights beyond the villa, while a personal driver with a nine-passenger van is included in the villa rate, providing a level of service rare among Phuket private villas. Some of the island’s best restaurants are located within nearby resorts, while on Kamala Beach you’ll find a range of watersports, including surf- and body-board rental. Golf courses, marinas, shopping centres and many outdoor leisure activities are all within easy reach. The villa is designed in an L-shape and spreads over four levels. An imposing woven-steel entranceway on the ground floor leads to a corridor housing two bedroom suites and the extra (sixth) bedroom. 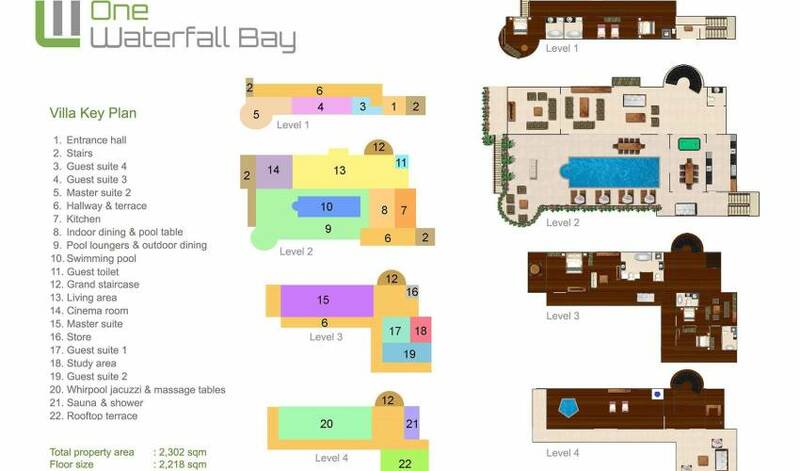 The three floors above are connected by a grand central staircase and arranged around the pool and central courtyard. The top floor boasts the villa’s spa room, steam sauna and rooftop terrace, while one level down are three bedroom suites and a study. The dining and games room, kitchen, living room and cinema room are all at pool level. With prime sea views, this spacious and stylish third-floor suite features a private living room complete with a home theatre system incorporating a 42-inch-screen TV, a comfortable sofa, desk and mini-fridge. A sliding door leads to the bedroom, which is furnished with a king-size bed and features a second entertainment unit (with 60-inch TV) as well as a private balcony. A large dressing room connects the bedroom to the bathroom, where a double jacuzzi is set in cool marble surrounds. A his-and-hers vanity plus two WCs and a rain shower offer added touches of luxury. Situated on the ground floor and with a garden view, this delightful king-bedded master suite blends fun and chic style in a unique circular room design, with furnishings to match. Heavy silk drapes, marble floors and a chandelier hand-woven in natural fibres boost the room’s understated elegance. A home theatre system and a generous bathroom with tub add to the suite’s appeal as an ultra-private retreat. Two king-bedded guest suites share the third floor with Master suite 1, each with comfortable sitting areas, spacious wardrobes, ensuite bathrooms with double bathtubs and a shared balcony. Sea views compete with the in-room entertainment units to capture your attention. On the ground floor, next to the second master, is a colourful twin-bedded guest suite with fun beanbag tables, TV entertainment and an ensuite bathroom with a bathtub and double vanity set. Beside this room is a modestly sized extra bedroom furnished with a king-sized bed and ensuite bathroom with shower. Elaborate furnishings, coupled with comfort and style are features of Villa 4295's wide range of indoor and outdoor living spaces. Rooms are all air-conditioned and accented with an eclectic, eye-catching mix of modern and Asian art pieces. Forming the heart of the villa’s entertainment zone is the pool terrace, with its shaded outdoor dining area and sofa seating with optimal ocean views – a great spot for unwinding poolside under the tropical night sky. Just inside is another dining area that doubles as a games room, complete with pool table. Here, a more formal dining table seats 10 below a modern black and white chandelier, while a second table to the side accommodates six more. Behind the dining area is the villa’s professional designer kitchen, where the chef prepares her magical meals. The elegant living room offers sea views and easy access to the pool and terrace via sliding glass doors. Adjacent is the dreamy cinema with its 90-inch projector screen and sublimely soft sofas. The glass wall at the back of the living room offers views of a soothing water fountain teeming with koi fish. The sweeping, stone-tiled staircase leads up to a relaxing study room with a desk and inviting sofa set in an open area adjacent to the three bedrooms on this level. The villa’s uppermost floor is dedicated to restoration and inspiration. Here you’ll discover the villa’s elaborate spa area with whirlpool and a steam sauna. Floor-to-ceiling glass floods the room with natural light and opens up the views of sea and sky. The roof terrace, furnished with stylish poly-rattan sofas, is the perfect spot for ocean-view sunbathing and sundowner cocktails. The personal chef at the villa is at your service to prepare daily breakfast, lunch and dinner. The villa offers an extensive selection of set menus and a la carte dishes featuring Thai and international cuisine to cater to all tastes, plus a choice of enticing vegetarian options. The chef is also more than happy to tailor meals to accommodate any special dietary requirements. A stay is not complete without sampling her tom yam goong (spicy prawn soup), gai pat met mamuang (chicken and cashew nut stir-fry), or platter of exotic fresh fruits. Set menus are priced to include service, while a la carte items and beverages are charged at cost price plus 17.7%. Guests will be requested to provide grocery money in advance, and the staff will do the shopping and keep the receipts for reference. To make the most of the kitchen and give staff time to shop, it is a good idea to plan meals the evening before. One of the greatest advantages of staying in a villa is the personalised service provided by dedicated staff. 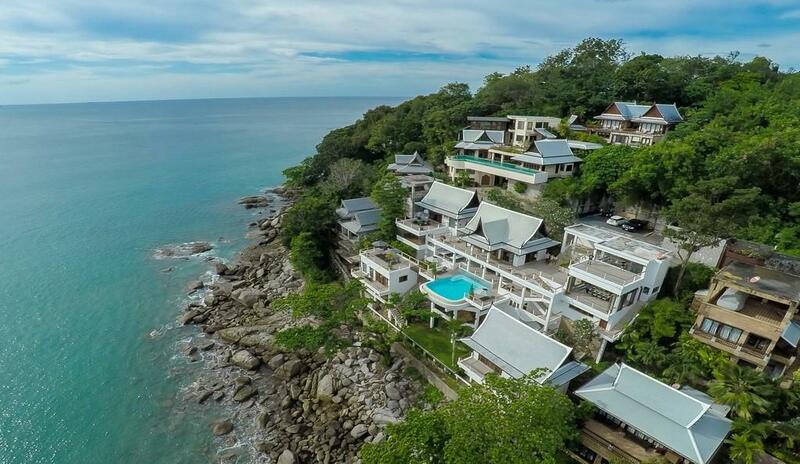 One Waterfall Bay’s staff have been professionally trained and will do their utmost to please with their warm and friendly Thai hospitality. The friendly manager is responsible for the overall operation of the villa. Her job is to oversee and coordinate the staff and property and to assist guests during their stay. The villa’s skilled private chef specialises in Thai cuisine but will happily prepare Western, Asian, vegetarian and children’s dishes and do her best to accommodate special requests and dietary requirements. Your guest relations manager is on hand to ensure all aspects of your stay are handled smoothly and with ease. From arranging golf tee-off times to recommending the best local sights and activities, your friendly host’s professional touch provides the perfect complement to the in-villa staff services. Two villa attendants look after daily housekeeping and domestic duties. One Waterfall Bay estate staff look after the villa’s lush gardens and swimming pool. A driver and car (seating up to 9 passengers) is available to villa guests for eight hours a day (excluding petrol). Estate guards provide 24-hour security. 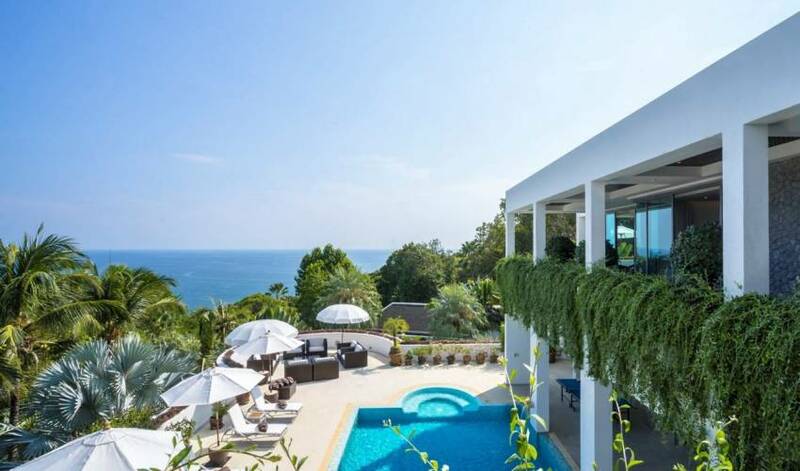 The villa is set in an exclusive five-villa estate with superb ocean views from its hillside perch. 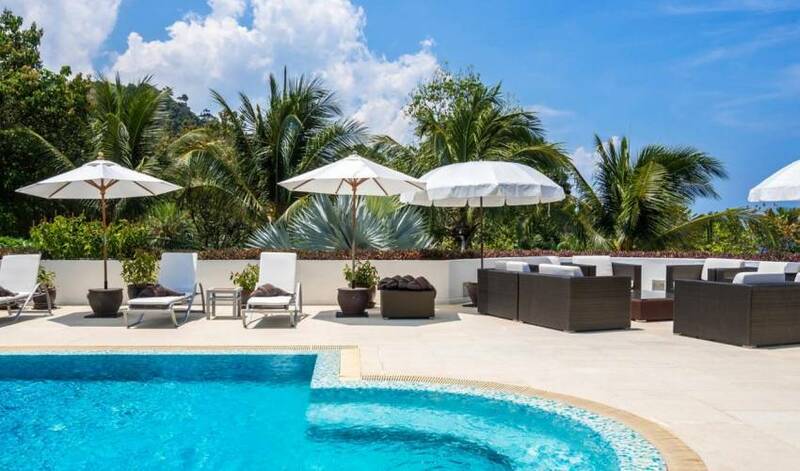 Located along the beautiful stretch of Phuket coastline known as the Millionaires’ Mile, the villa offers total privacy and peace yet the sands of Kamala Beach are just 6km away. A short stroll will bring you to the Paresa Resort, which has an excellent restaurant with views across the jungle-clad hill back to the villa. Other dine-out options, including the restaurants of Cape Sienna and Andara Resorts are just down the road – easily reached courtesy of your complimentary car and driver. The pulsating nightlife and street markets of Patong Beach are just over the hill, while Surin Beach to the north is a must-visit spot for sunset cocktails. the trip has been lovely…superb villa...I have a feeling we will be asking for it again!!! Thanks again for all your help…you have been very helpful!!! !